Embroidery is one of those crafts that I picked up by reading, watching, and trial-and-error. I was given a great little book and a Stitch-It-Kit from Sublime Stitching that put everything I needed in one place. Unfortunately, it was a hand-me-down kit and was therefore missing parts and parts of a couple pages. Either way, I have become quite attached to embroidery and find the repetitive motion soothing. It’s a great skill that can be applied to nearly everything. 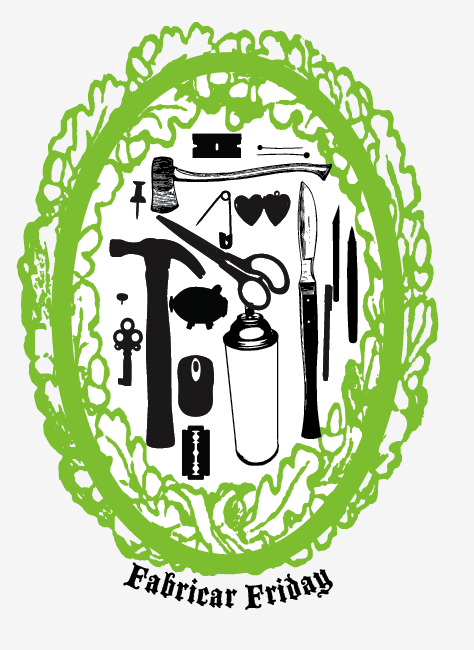 I use it to embellish shirts and purses, make my own iron-on patches, and to create stand-alone works of art. I even did some very small scale embroidery that I set in resin to make pendants. 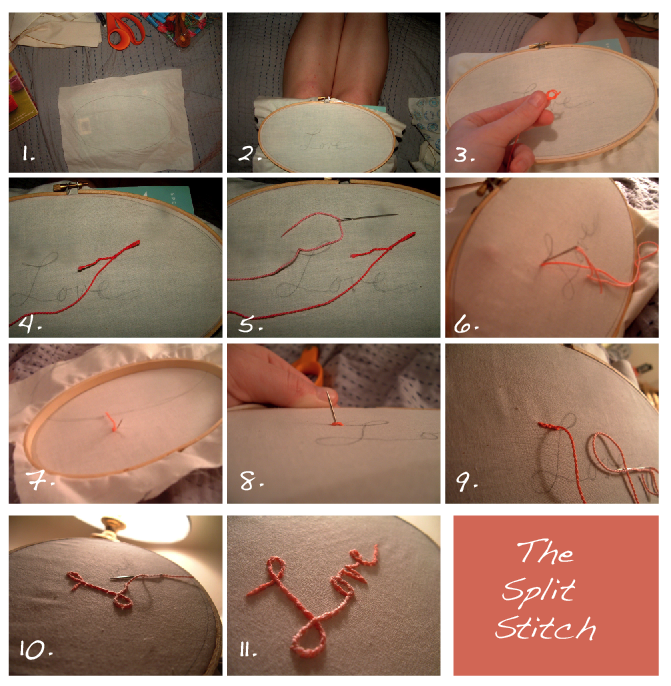 The split stitch is a simple stitch that I really like. It’s fairly simple to execute and looks very finished. I use it in the example below for text. The embroidery floss is made of several strands and the second stitch splits the threads of the previous stitch. In my head, it’s equated to that verbal math problem about the frog that jumps up two feet but falls back 4 inches every hour and is stuck in a 10 ft deep hole and they want to know how long it will take him to jump out. Okay, that’s probably obscure for everyone else because my brain makes connections in weird ways. Moving on … The thread starts beneath the fabric in the hoop and then back in a short distance later. This is one stitch. To make the next stitch, and start to see the way the stitch looks, bring the needle back up from the underside, through the fabric and through the middle of the stitch. The needle and following thread should come through the previous stitch, up and then back in a short distance after the end of the first stitch. Who’s lost? If you learn better through video check out Make It Magazine’s videos on YouTube. Or anyone else’s. 1. Here, you’re supposed to ignore the legs in the photos. I traced the hoop onto the fabric so that my design can be created within a safe area. And it won’t be too close to any edge to make it difficult to stitch. 2. I prefer to sketch my designs in pencil on the fabric. I get sloppy when I freehand, but don’t often use patterns. 3. I knot the end of my thread that is farthest from the needle by folding the thread over and then tying a knot. Pro: Never too small to slip through. Con: sometimes too big if you need the fabric to lie flat for the end piece. 4. To trim this knot, I would pull that little lose tail of the thread to the right with the other and trim it as closely as possible. 5. I don’t knot the end that’s close to the needle because it makes it difficult for the needle to travel through the fabric. If you force it through, your other knot is pretty useless and will go right through the larger hole. 6. Make the first forward stitch. Up from the underside and a short distance forward and then back into the fabric. Plenty of people do this without going down and back up, but I’m just not that fancy. Their motion is more sideways and less up and down. 7. A view from the otherside. 8. Splitting the stitch. The needle and thread part the thread of the previous stitch as it breaches the fabric. 10. Curves can be tricky. You may need to use the downstroke of the stitch to pin down the previous stitch to the curve. This is where having drawn out your design helps. If you don’t like your own handwriting, print out a font you do like and trace it. 11. Enjoy your hard work. 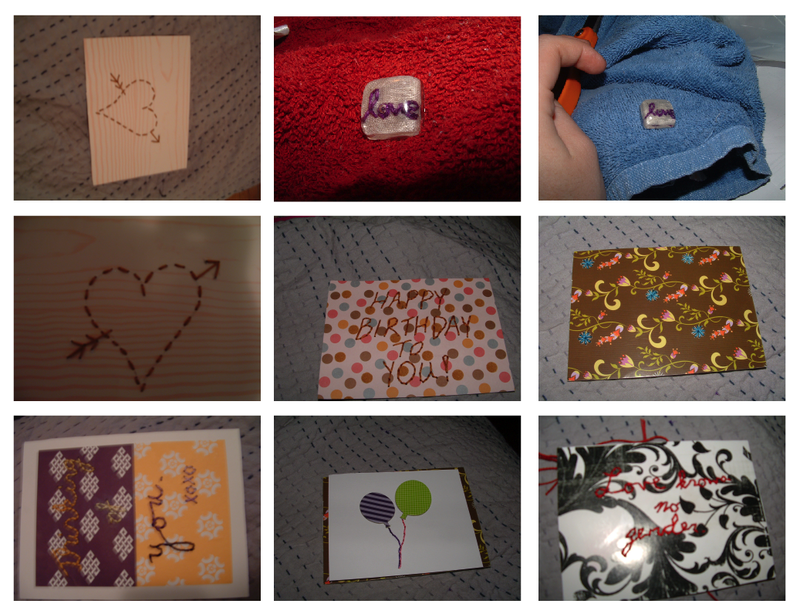 I’m pretty proud of the photographs used to assemble the above collage. I tried damn hard to get that macro working for me instead of against me. If it wouldn’t eat up so much storage, I would post the full images for you to enjoy too. Here are some other projects that have involved embroidery. If you have questions, please ask!! I’d also appreciate any feedback. omg.. is that one of the resin pendants?? it looks great! There’s something about me and thread that just isn’t compatible…I’m just going to enjoy my courticus original!